Write your last, but best Mains Mock test with us! | 15th September | Register Now! What if you could write the Mains once before the actual Mains examination? There is no mock test better than the actual UPSC Examination. True, we agree. The stress and discipline of writing the Mains examination is only experienced in the actual examination for may candidates. Whether your pen/ hand will support you for 27 hours of writing? Not only that, but candidates also see that their writing speed gets enhanced after the Mains, but by that time the exam is over! What if you knew your lacuna before realising in the actual Mains Examination? Just like people who have already written the UPSC Mains Examination last year! We invite you to write the Test in simulated exam environment as per the below schedule with us. Write your last, but best mock with us. 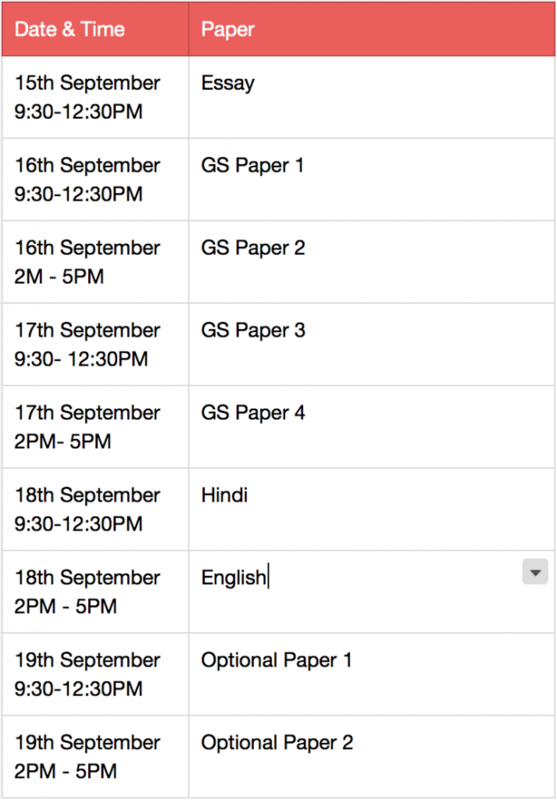 Solutions will be provided for GS Papers only within 48 hours of the test , in PDF format. Your must register for the Open Test before 13th at http://academy.forumias.com . You must be logged in to register. There will not be any evaluation of the tests. The tests are to be written for practice purpose. Please help us with enforcing the discipline and the timelines. Help us help you! If you are a first timer, we strongly recommend your write these tests with us!